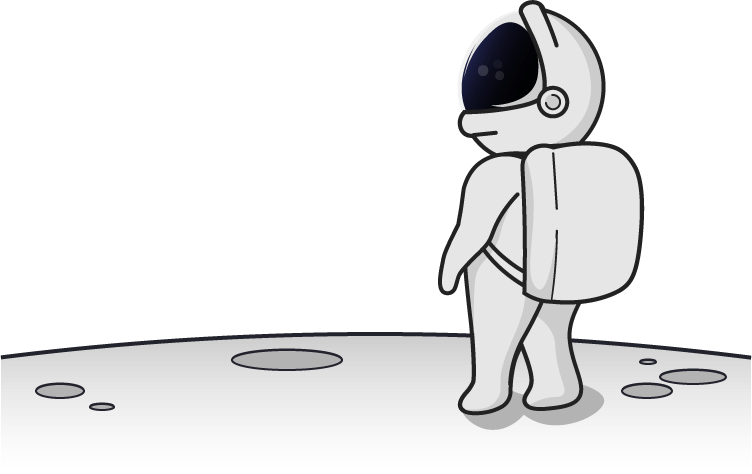 A Quick Note: This blog about ad extensions has been…extended. We’ve added onto it since the original publication to keep up with times and provide more detail. In the world of Google Ads, you have a mission; your mission is to make money. One way to make that money is by having your ads take up more space in the search results. You know how people will say that “bigger isn’t always better”? When it comes to my height, I completely agree. But when it comes to your Google text ad, you’ll need all the space you can get. The science is simple; the larger your ad, the more room for clicks there are. And more clicks are better. That’s where Google Ad Extensions come into play. Yes, my friend, ad extensions are free real estate for your text ads. There are 10 extensions; I’ll cover them all, but let’s start with the basics. Google Ad extensions are exactly as their name implies. 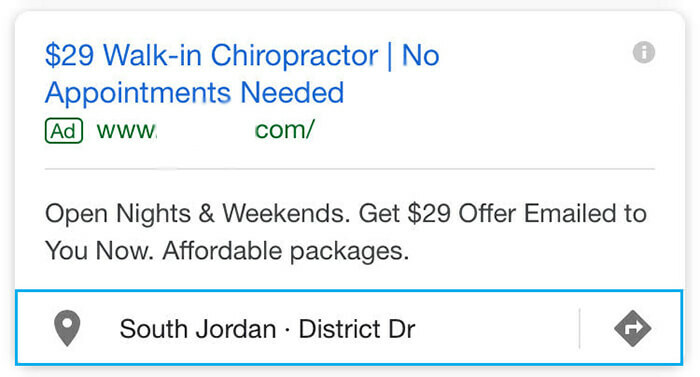 They’re extra text that you can add onto your text ad in Google. 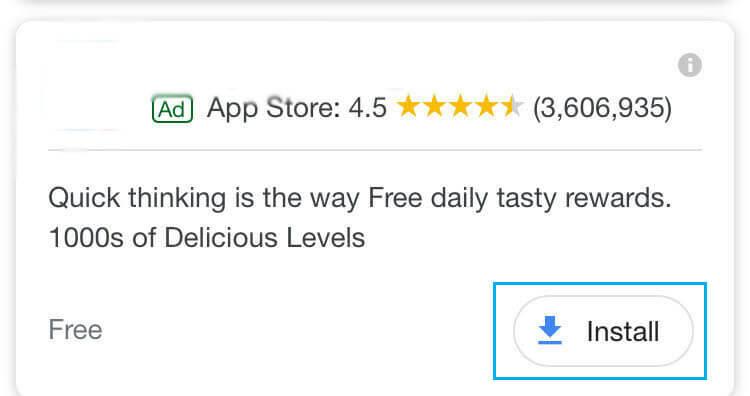 Take a look at this ad below, courtesy of Google. This is an older ad of theirs before the text ads had a greater character count. (More on that later.) The ad extensions are highlighted in blue, but I actually missed one. At the end of this article, comment and tell me which one I missed. But as you can see, the ad extensions highlighted doubled this ad’s space on the page. They also show more information about Google AdWords. They specifically list a few benefits, the styles offered, and what appears to be links. Intrigued yet? Serious Reasons Why Google Ad Extensions Are Great. Google Ads have come a long way since their initial AdWords text ads. Initially, you were limited to a scant number of characters allowed in your text ads. Nowadays you have three headlines with a max character count of 30 each, and two description lines with max character counts of 90 each. My word, that’s riches in terms of text ad space. But does that mean that ad extensions aren’t valuable anymore? NO STINKEN’ WAY! Before a customer clicks on an ad, there are a few things they may want to know. For instance, they may want to know your location, or they may want to know your phone number. It isn’t wise to fill your ad text with your phone number or your location. Can you imagine the number of characters that will waste? Not to mention the time you’re spending manually typing in your information again and again for each new ad. You’ll not only have that important information available on your ads, but you also won’t be wasting any ad text with it. It’s a win-win for you. The first ad takes up six whole lines all by itself, and they even have a “more” option with a drop-down. Although the second ad takes up four lines instead of the six, the addition of sitelink ad extensions and the location extension add more color and draw more attention to this ad. It’s also great to see their hours on the ad. The last ad only used the phone number extension. While this is valuable, they could’ve done so much more with their ad. By comparing these, you can see which ads are more likely to get clicks simply due to their size and amount of information. The next few perks snowball one after the other for an ultimate benefit. Let’s start with the basic one that’s a guaranteed perk of using ad extensions. Not to be confused with your Google Ads Quality Score, your Ad Rank is how Google determines if and where to show your text ads. 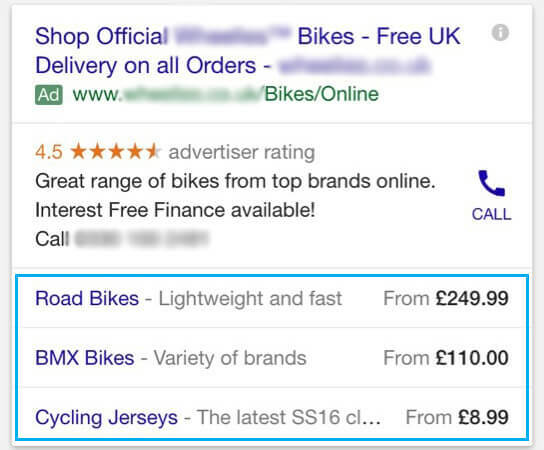 From Google directly, having ad extensions will automatically increase your Ad Rank. Google favors them because it allows Google to offer a better variety of ad formats and include more relevant information for the searcher. If the words “Quality Score” are completely foreign to you, check out our blog here. Your Quality Score is a ranking from 1-10 on how relevant Google thinks your keywords, ads, and landing pages are. Google gives its advertisers a Quality Score so it can continue to show relevant results for its users. Ad Extensions do NOT directly affect your Quality Score. In two brief sentences, Quality Score is made up three main factors. Click Through Rate, Ad Relevance, and Landing Page Experience are those factors. Having a higher Click Through Rate, as mentioned right above, can improve your Quality Score. 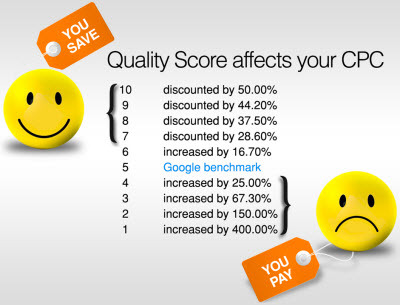 And if you’re not sure what a better Quality Score can do for you, consider that Google kinda sorta sets the pricing. They also want you to have a higher Quality Score so the search results are super relevant to the search terms. In order to encourage advertisers, Google cuts deals for those with high Quality Scores. Wordstream’s explanation of Quality Score’s effect on your CPC. If you’ve followed along to this point, then you’ll know that using ad extensions will raise your ad rank, can take up more space on the page, which can both increase your Click Through Rate. An increased CTR leads to an increased Quality Score. And a higher Quality Score can lead to a lower Cost Per Click. The lower your CPC, the less you’re paying per click. And the less you’re paying per click, the less you could potentially pay per conversion. The less you’re paying for a lead, the more money you’re making for less money being spent. Do you get it? Good. Let’s move on. So How Do You Add Ad Extensions? From your Google Ads dashboard, click the Ads & extensions option on the left navigation bar. At the top, you’ll have a few options; your extensions option will be right in the middle. Click here to view all your extensions. Pro Tip: From a Google Agent, all extensions should be added at the campaign or ad group level for best results. With this being said, work through your extensions on a campaign-by-campaign basis or an ad-group-by-ad-group level. This even includes ad extensions that you’d like to use across your entire account. Adding them at the individual level helps ensure they’ll be shown more frequently. You can toggle between campaigns and ad groups by opening the far left navigation bar. And when you are adding extensions, write them to be as specific to each campaign or ad group as possible. But certainly, I shouldn’t need to tell you how to write things in your own account. We’ll go over each of them individually, but here are some settings that are universal for them. These are ones you’ll want to pay attention to for every ad extension. Make sure you’re adding the extension where you want it added. You’ll also always have the option of writing a new ad extension or applying existing ones. This is a huge time-saver for you. When you choose to use existing ad extensions, you’re shown a list of all the ad extensions you have in your account. You can then go down the list and check which ones you’d like to add to that campaign or ad group. An often overlooked part of Google Ads, in general, are your advanced options. Don’t skip by them, friend; it’s a rookie mistake. In essence, if you want your ad extensions to appear on mobile devices, you’ll click the box. Considering a lot of us spend our time on and searching on our phones, you’ll want to make sure your mobile ads are as beefy as possible. Then you can add a schedule to your ad extension.  If you something that’s seasonal, or a promotion you’re running for a period of time, don’t leave it up to your memory to turn it off on time. 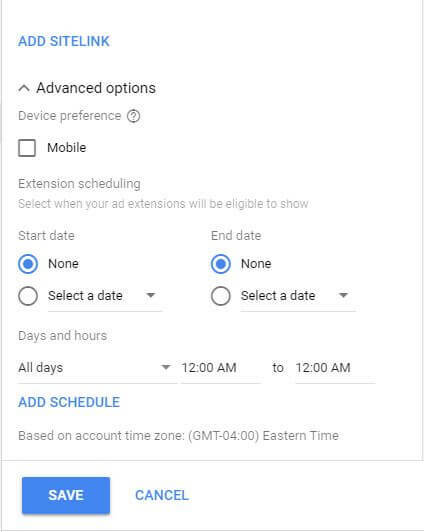 You can set a start date and an end date for your ad extensions. You can also set up your extensions to only show during specific days and hours. If you have a call extension, make sure to schedule it to run only when someone’s around to answer the phone. Don’t pass the advanced options by, and you’ll be running your account so much smarter. Let’s say you have one campaign all set up with beautiful ad extensions. Now let’s say that most of these ad extensions are ones you’d like to add to one or more other campaigns. Instead of going into each campaign and manually adding the extensions, you have another option. When you check the little box next to your existing ad extension, you’ll have some options appear. Under the Add to drop down, you’ll be able to add the ad extension/s to your account, campaigns, or ad groups. You also have the option to select as many of those extensions as you’d like to add them to the different levels. As a note, you are limited to a total of 20 ad extensions per campaign. What Are The Types of Ad Extensions? Sitelink extensions are extensions that offer more information and can be clicked on to send your traffic to another page. Here, people can choose to click on Pricing & Packages or Success Stories to visit those special pages, or they can visit this company’s landing page. Either way, their ad is taking up the amount of space that two would take up. And the amount of information they’re offering is like three ads in one. While they don’t take up as much space, they still add color and information to your ad. Remember that your description lines won’t always show, so make sure your sitelink text is creative and eye-catching. Lastly, because your sitelinks will connect the user to specific pages of your design, think about where you’d like to send your potential customers. Think about what you’d like to go if you were searching for your product or service. Great pages for sitelinks are contact us pages, testimonial pages, and pricing/offers pages. For eCommerce sites, you have many more options for sending customers to category pages or specifics pages. If you have a promotion that you’re running, build a landing page for it, and then a sitelink too. Don’t forget you can schedule your extensions to start and stop at a specific date. -Each extension is for a new web page; Google won’t allow you to have three sitelink extensions for one link. Callout extensions are excellent in that you can list just about anything in them for extra space and information on your ad. The only stipulation that Google puts on these is that you can’t repeat them. So you can’t have three callout extensions saying the exact same thing- no problem, right? Structured snippet extensions allow you to list things that you offer. They take up a good amount of real estate, and they allow people to learn what you offer before they click. They’re also an opportunity for you to list your key benefits and easily apply them to all your ads. That’s a lot of options, and you’ll want to spend some time looking through the options. Chances are, no matter what you offer, there will be a header type for you to us. We’ve compiled a handy-dandy cheat sheet below for each of the types of headers. It’ll list the name of the extension, what it is, good examples, and bad examples. Remembering that you can schedule your ad extensions is also useful for these as well. If you have seasonal products, shows on a schedule, or anything of that sort, you can schedule and rotate them. Perhaps the most widely used extension, the call extension is a life saver for all businesses out there. You can put your phone number directly in the ad. You can enable it as a click-to-call and allow customers to easily reach you from mobile. Google allows you to track calls from extensions as conversions. 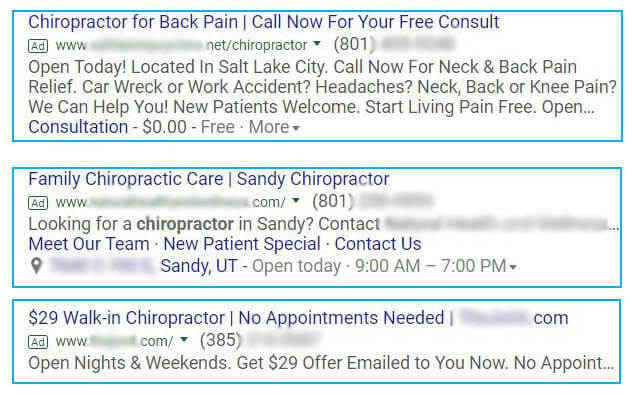 A recent addition to Google Ads’ metrics includes some minor call tracking. They offer a call details tab that will show you the number of phone calls, phone impressions, and phone through rate (PTR). If you’re looking for more detail in your phone tracking, we recommend CallRail or Invoca as great tools. 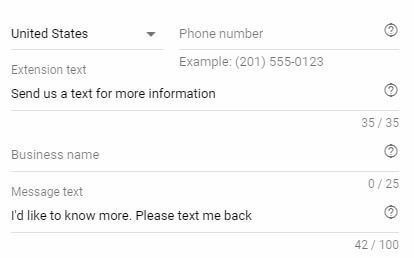 This nifty little, mobile-only obviously, extension allows customers to text a support number quickly and easily. The future has arrived. 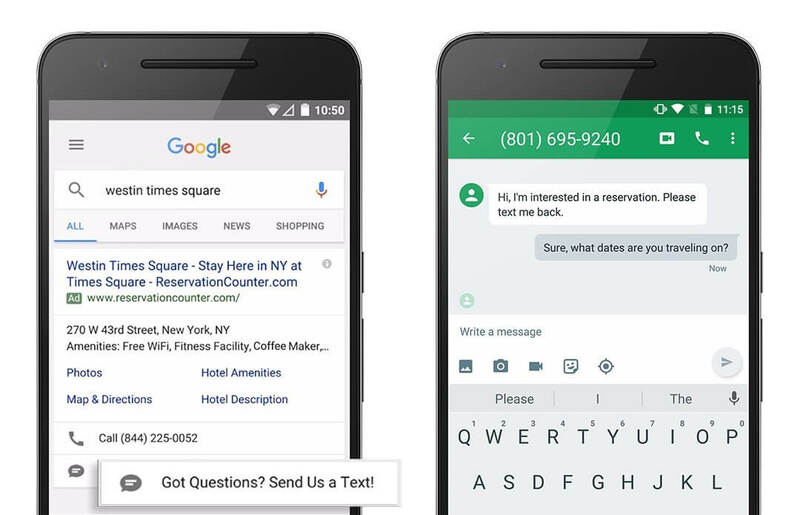 As this example shows, courtesy of Google, the customer sends a text message, and the conversation is moved offline. When setting up the message extension, you choose the number they text to, what the extensions says, and their opening message so you always know what they’re texting about. A location extension is a must-have for any brick-and-mortar that requires the customer to come to you. 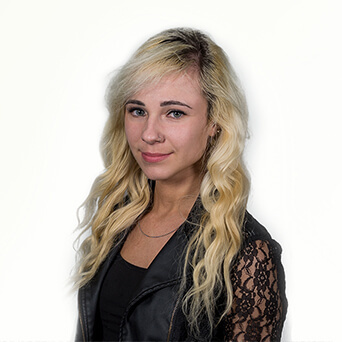 You set it up through Google My Business, and then you can easily add it to your extensions. Most of the time, the extension will show the full address, but on mobile, it can drop some of the address and instead offer to open directions to the business in their maps app. However, it’s important to note that if you come to the customer, you might not benefit from a location extension. In fact, it might hurt your conversions as people will assume they have to visit you to get your service. Keep an eye on how your conversions perform before and after adding a location extension. Affiliate location extensions can be a little tricky to understand. Let’s say you want to sell your physical product – like a cell phone – but you want the customer to know that they can buy it at any of your authorized retailers – like Verizon Wireless. You’d then link the Verizon Wireless stores that your phone is available at as an ad extension. This will give the customer the option of making an online purchase or visiting the Verizon store to make a purchase. The price extension ads are pretty simple; they’re upfront pricing for the products you’re selling. It can help people understand what you’re offering before reaching out and booking an appointment or showing up at your store. 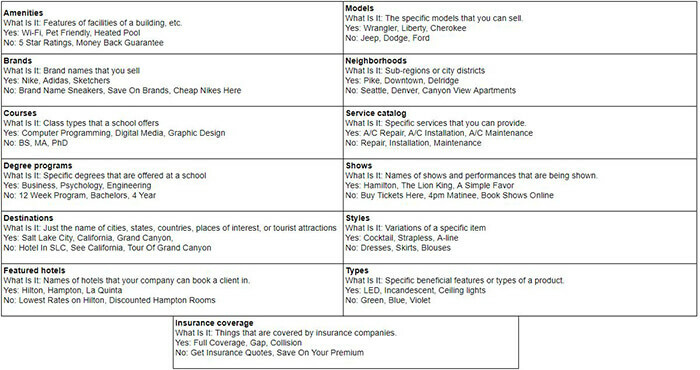 This is great if you have different options you sell, different levels of your service, etc. If people end up clicking on your ad after they see the pricing, they won’t feel blindsided on your landing page. They’ll have a higher conversion or purchase intent. 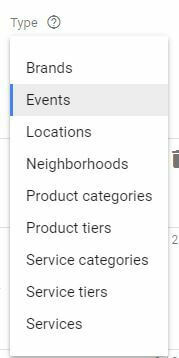 Similar to structured snippet extensions, Google gives you a range of options to choose from for the type of product or service you’re selling. We can see in the original bike example that they’re using the “from” price qualifier to advertise their lowest priced bikes. This ad extension is amazing for granularity in your account. 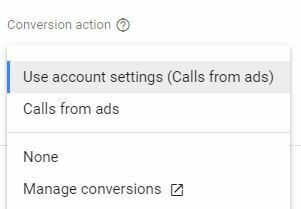 When you organize your account, you can add these ad extensions at the campaign or ad group level to make them as specific as possible. If you offer a mobile app, pop this Google ad extension on here. People loathe buying things through their phone’s internet; adding payment information is a pain, web pages aren’t always optimized for mobile, and the load time on those mobile browsers are excruciating. People will always want to download your app before purchasing, and the quickest way to benefit from that is to make an app extension. One of the more frustrating things as a company is to have a promotion, list it everywhere you can think of, and then see no one use your code or applies for the promotion. Sure, you just got some full-priced sales, but who knows how many people didn’t make a purchase because they didn’t see your promotion? This company won’t have that problem. Against all the other competitors on the page, they were the only ones with a promotion extension, and 60% off sounds pretty good. While you can always run a general deal promotion, Google also offers seasonal promotional tags. Just make sure to schedule your seasonal promotion ad extensions. We’ve all seen fall ads in spring and New Year’s Deals in July. The last extension isn’t on the list that you can add yourself. Google runs automated extensions, which are extensions that they choose to show with your ads. You can find yours right next to the extensions tab. 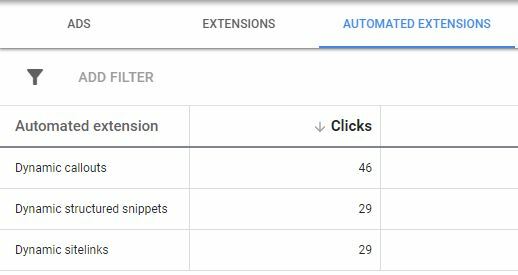 There, Google will show you the automated extensions it’s running for you, and you can see the stats for each one. If you’d like to opt out of the automated ad extensions, you can do so by going to the more option, going to advanced options, and turning them off there. However, considering that these are extra extensions handpicked for you, from Google, you might be a little ungrateful if you turn them off. 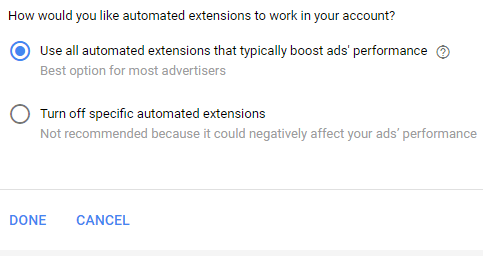 Also, considering that ad extensions don’t cost anything extra, and that not all accounts get automated extensions, it’s a good idea to keep them on. Ok, now that you know all about ad extensions, you’re probably thinking about adding every single one of them to your campaigns. But before you dive in, make a plan. You’ll want your ad extensions to be as relevant to your ads as possible. Make sure the ones you add to each campaign or ad group level make sense. As always, you’ll want to test your account performance. This includes testing how the ad extensions are affecting it. What ad extensions are you using now? Are there any you’re going to try out now? Let us know your experiences in the comments!